Texas A&M AgriLife recently awarded Dr. Charles W. Graham with the Distinguished Texan in Agriculture Award, the highest honor given to those who demonstrate outstanding leadership and significantly contribute to Texas agriculture. Graham received the award on April 6th at the Texas and Southwestern Cattle Raisers Association Convention, in San Antonio. A graduate of Texas A&M University with a Doctor of Veterinary Medicine Degree, Charles Graham became a partner in the Elgin Veterinary Hospital in the early sixties, alongside Dr. W.H. Cardwell, building one of the largest equine veterinary facilities in the U.S. He is the president of Texas Quarter House Association, Texas Thoroughbred Breeders Association, and the Texas Veterinary Medical Association. Through these associations, he held an important role in gathering support from legislators and voters to horse races. Currently, he owns a number of other businesses, including the 1,300-acre Southwest Stallion Station in Elgin, which has bred some of the top stallions and broodmares in the quarter horse industry. 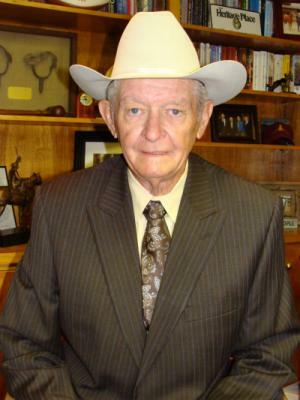 His work earned him a place at the Texas Horse Racing Hall of Fame, in 2002, the American Quarter Horse Hall of Fame, in 2009, and numerous awards, including the 2010 Texas A&M University College of Agriculture and Life Science Outstanding Alumni. Graham has also served on the board of directors of the Elgin school district and as a member of the Elgin Kiwanis Club and the Thorndale Masonic Lodge. Nowadays, he supports youth involved in 4-H, FFA and other agricultural organizations, through his participation in numerous stock show events. In 2005, the Star of Texas Rodeo of Austin named its new offices for Graham. Mark Hussey, interim president of Texas A&M University and the vice chancellor and dean of agriculture when Graham was selected as the honoree, sees Graham as “a legend among those in the equine industry” and an example of what the Distinguised Texas in Agriculture Award “is all about.” Bill Douglas, acting vice chancellor and dean, also considers Graham to be “most deserving” of this award.